Chroma key is simply indispensable when you need to superimpose another background on an image or video in Minecraft Pocket Edition. Thanks to this pack, it is possible to record the videos together with other players and add a certain background along with the effects. The green background can easily be removed, with the player models remaining unchanged. Perhaps this is the best tool when editing clips or editing images. For example, you want to send your characters to the moon. To do this you no longer need to build a lunar landscape and spaceships. Just activate this pack and take a few screenshots in different positions. Then find a suitable picture of the surface of the moon. Now you only need to combine both pictures and edit a little in case of small errors. There are a lot of photo editors, as well as manuals for use. You will need a little time to understand the principle of work, additionally known photo editors contain special tools that remove the green background in one click. 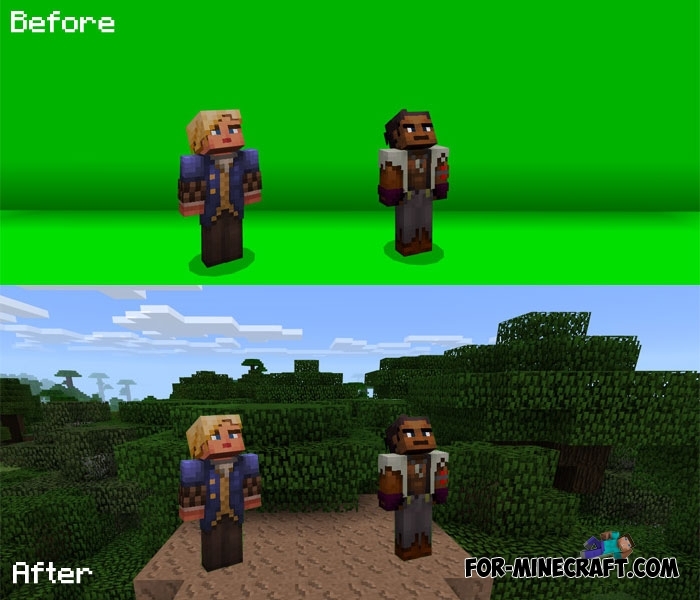 The Chroma Key pack is used by many YouTubers when creating clips, try it yourself. If someone does not like the green color then install the red chroma key. Chroma Hills Texture Pack for Minecraft PE 1.0/0.17.0It would be cool if Chroma Hills pack was originally included in the game..